The RAPCO FAA-PMA approved line of pneumatic system filters provides quality replacement parts at reasonable prices. 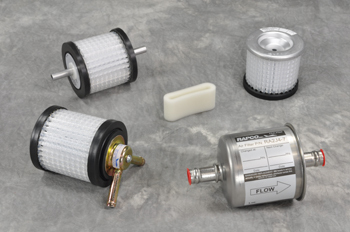 RAPCO filters are made from 0.3 micron filter media and meet or exceed industry standards. Routine filter replacement is important to a long service life for gyro instruments, and dry air pumps. See recommended replacement times and always be sure to replace all pneumatic filters when replacing dry air pumps. Replace at least every 500 flight hours, annually, or with each dry air pump change, whichever comes first. Replace at least every 100 flight hours, annually, or with each dry air pump change, whichever comes first.